Dermot Gallagher returns with Ref Watch as he casts his eye over contentious incidents from the midweek Premier League action. 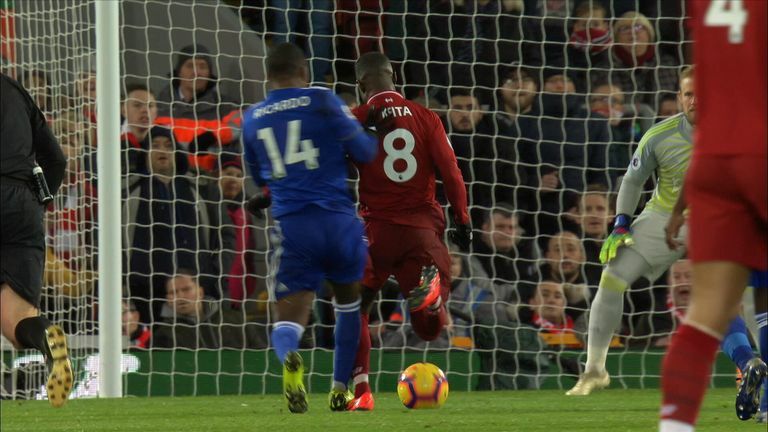 Should Liverpool have moved seven points clear at the top had Naby Keita been awarded a penalty in their draw with Leicester? Might both Danny Rose and Dale Stephens have been sent off over the midweek round of games? INCIDENT: Harry Maguire brings down Sadio Mane just inside the Leicester half with the Liverpool forward finding himself in behind the visiting defence but receives only a yellow card. DERMOT SAYS: I think this is a first-class decision from the referee. There's no doubt it's a trip but the law says (Mane) must be in possession of the ball or able to gain possession. He's not in possession and he wouldn't gain it because the Leicester player would intercept the ball. It's a yellow card. INCIDENT: Ricardo puts a leg in on Naby Keita inside the penalty area, and the Liverpool midfielder goes to ground but no penalty is given. DERMOT SAYS: It's a penalty but me but it's a 'TV pen'. There's so many bodies in the way of the referee it's a tough call. I think Martin Atkinson sees him skim the ball but doesn't see that he gets clipped on the back of the ankle. Should LIverpool have been awarded a penalty when Naby Keita was challenged by Ricardo Pereira? INCIDENT: Tottenham's Danny Rose lunges in on Watford's Daryl Janmaat in apparent retaliation for a crunching challenge moments before - but it goes unpunished. DERMOT SAYS: When you see this, it looks a very bad tackle. If the referee sees what we're seeing, it's a red card. It's airborne, it's two-footed. 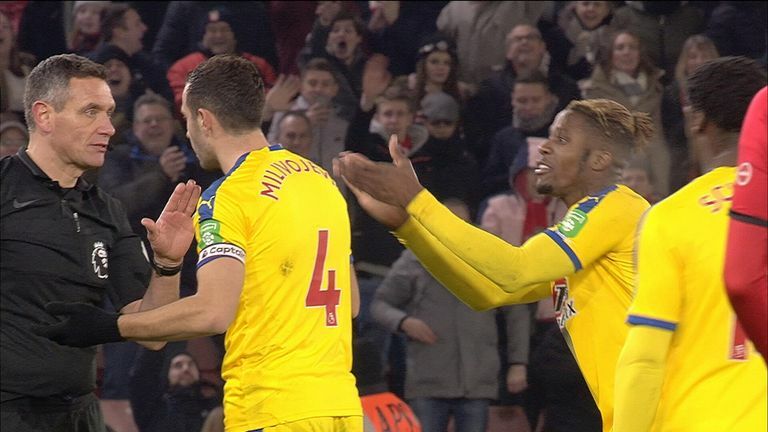 INCIDENT: Crystal Palace's Wilfried Zaha was shown a second yellow card in a matter of moments for sarcastically clapping referee Andre Marriner after he is not awarded a free-kick. Wilfried Zaha was on the wrong end of two yellow cards from Andre Marriner after lashing out at James Ward-Prowse and then applauding the referee’s decision. DERMOT SAYS: It's not the wisest thing to do. He wants a free-kick but then it's all over a throw-in. He slaps out - it's not violent, he's going to get a yellow card - but then you see what he does to the ref; he completely mocks him and you just can't do that. Once you've been ridiculed like that in front of the crowd, you have to take action. INCIDENT: Southampton's Jack Stephens flies in on Andros Townsend but, again, no card is shown. DERMOT SAYS: It's another red card. For some reason - it might be the speed, or the viewing angle - the officials have not identified the severity of the tackles. I think they've seen them but not realised the impact. INCIDENT: Dale Stephens goes in on Fulham's Andre Schurrle with his studs raised, but referee Lee Probert shows a yellow card. DERMOT SAYS: I think the referee has completely misjudged this. It sounds strange but it might have been too close for him to see the speed at which he hits him. It's so much easier when you're standing here reviewing these incidents - I just don't think the ref has the panoramic view that we've got. INCIDENT: Sead Kolasinac and Oumar Niasse compete for a ball in the box, with the Cardiff man appealing for a penalty when he goes down. DERMOT SAYS: I just think the two players are bustling together, going for the ball. It'd be very harsh to give a penalty like that. The players are together, that's the key. INCIDENT: Cardiff defender Bruno Ecuele Manga takes down Arsenal's Alexandre Lacazette with a clumsy challenge but Mike Dean is unmoved. DERMOT SAYS: This is a very interesting decision because it's almost an afterthought for Lacazette to go down but then he seems to think, "Have I been fouled or haven't I?" I think that makes up the referee's mind. INCIDENT: Lacazette is caught by Manga again just inside the box and goes down, but no penalty is given. DERMOT SAYS: The first time I watched it, I thought it was simulation. When I watched it again, you see Manga just treads on his foot. The referee is right down the line and can't see it. INCIDENT: Arthur Masuasku and Matt Doherty clash in the West Ham penalty area, with the Wolves man going to ground but David Coote waves away claims for a penalty. DERMOT SAYS: My colleague and I were split on this; I thought no penalty, my colleague thought it was one. Masuaku's yellow boots are a clue for me. I think it's a yellow boot that plays the ball. He gets the ball, Doherty gets wrapped up with him and falls over. INCIDENT: Burnley midfielder Jeff Hendrick tugs Jesse Lingard to the floor with Burnley leading 2-0. Referee Jon Moss pointed to the spot for a penalty, which Paul Pogba converted. DERMOT SAYS: I thought it was a penalty and I think Hendrick did too. Why do you have to swing a player like that? I think it's a foul. When you see it, I think it's quite clear Hendrick has pulled his shirt.